B&B Adelche, Bergamo, Włochy : Rezerwuj teraz! 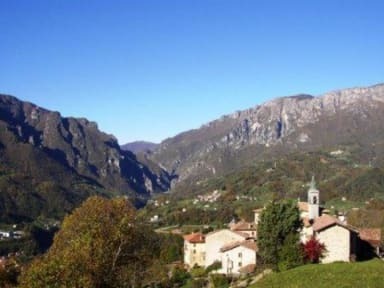 B&B Adelche... a small charming building, welcomes you in the heart of Val Brembana, only 32 Km far from Bergamo and 15 minutes from San Pellegrino Terme . Situated in the middle of the Valley at 700 meters above sea level. Our resort offers you a spectacular view of Mount Concervo and Mount Venturosa. Its central position is ideally located to easily reach ski areas (cross-country skiing, downhill, alpine ski), to play summer sports ( trekking, rafting, climbing, alpinism etc. ), as well as to attend every cultural and gastronomical events of this wonderful valley benefit from the famous San Pellegrino Terme (Spa). Completely restructured according to the criterions of the bioarchitettura it is the ideal environment for those people who love the nature and the relax. Rooms are furnished respecting the parameters of the quality of sleep and are reorganized respecting the bio-architecture. 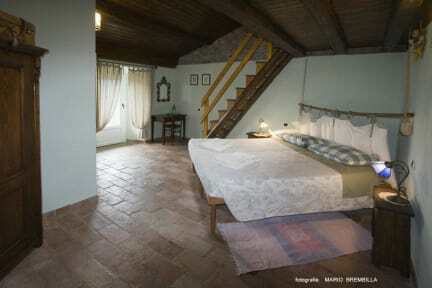 Terracotta floors and oak-beamed reflect the rural aspect of the rural district.Its a perfect location for families and groups; it has a wide loft. View on the Orobian Alps from the balcony. Besides for the guests they will be prepared base breakfasts of local products and typical of the tradition bergamasca. Please always contact the guesthouse to advise about your arrival time, as there is no 24hour reception. Check-in from 16:00 - Check-out from 10:00am.